B is for Ball: I have just been clued in by my much wiser and more maternally oriented younger sister Marcet, and also by my much wiser and more maternally oriented former assistant Desiree, about the real purpose of the Bag of 100 Balls. Apparently they are for something called a "ball pit." "You get a little tent that zips closed and put all the balls in it. Then you zip the kids in and whoo hoo! EVERYTHING is contained and you can have a moment! Well, I guess you would have to make sure the twins did not damage each other, but at least the balls wouldn't be running everywhere! The tent was probably in the aisle next to the balls :)"
Hmmm. Thanks for that now. I guess on our next trip home we'll need to invest in this part of the game. I really need a moment. Desiree even suggested we buy MORE balls for maximum impact. Yes. Perfect. As I write this Hayden is pitching balls into the toilet. B is for Broken Ribs: After his tumble down wet stairs carrying Delaney (she's fine), Mike is still on pain killers and sleeping in chairs (he moves around the house all night in search of one that's comfortable). He finally saw a doctor, but blew off the chance for X-rays, so we don't know if any ribs are broken or not. Boys will be boys. B is for Bananas: This morning at 6am our missing banana bunch was returned to us by gardener Senor Gomez. I guess he took them home with him to finishing ripening. The real nuances of this story are totally lost in translation. We thanked him for bringing them back to us, and ate bananas for breakfast! B is for Beach: I'll end today's lesson at the Beach, where Hayden has found a Boat and Delaney has found her Belly-Button. Bye-bye! Last April, Palmetto's foreman Don Carlos unexpectedly appeared at our doorstep with almond-wood artist Alfred Connor James. To our surprise, Don Carlos had told Alfred that our new home needed some island art and brought him to us. Alfred carried a totem-like sculpture for us to consider purchasing, which we did. Alfred explained the sculpture's story: The bird at the bottom is chasing the dog in the middle chasing the iguana at the top chasing the monkey on side, all after the fruit. "The action is in the bananas," Alfred explained, "it's always in the bananas." Our gardener Senor Gomez built a base for the sculpture by pouring concrete into a bucket, bolted it together, and installed it in our garden. Since April, the garden has blossomed beautifully as if indeed, it needed art in its midst to flourish. Our garden is also home to lots of banana trees, most of which Mike has planted. Like Alfred's sculpture, these bananas see a lot of action. We anxiously await each bunch to ripen before we are able to chop it down, and often they require propping up and tying because they get so heavy. The last few weeks we've been waiting on one particularly lovely bunch but alas, we were not the ones to win the chase for this fruit. Someone macheted it before we had a chance to. Now it's hard not to be angry when someone steals your bananas, but I remind myself that living on an island does make everyone think that picking fruit as they pass by it is one of the best shortcuts to a good dinner. Even Hayden and Delaney have adopted this habit: they now recognize guava trees wherever we go and impatiently wait for us to pick them each a guava-to-go. They eat them like apples. We have since come to recognize Alfred-the-Almond-Wood-Artist's work in other places. A number of his pieces adorn the Palmetto restaurant, for instance. Delaney likes to ride one of his giant sea turtles that sit by the resort pool. "Take me away," I imagine her thinking. "We have some banana-chasing to do." I just read a funny story by another Twin Mom who stood shaking her head in Target over a toy that encouraged kids to play in the dark, when they were supposed to be sleeping. "Now who would think that's a good idea?" she asked herself. The answer, of course, was her Husband. He had already added the toy to his shopping cart on the next aisle over. We've recently had a similar experience. On our trip to Houston last month, Mike spotted a bag with 100 balls. No instructions about what you were supposed to do with them, but boy, he thought they were cool. "Do we really want to pick up 100 balls each night?" I asked tentatively. Yes, it appeared we did. "Can we really fit that big bag in our luggage?" Yes, it appeared we could. And so home we came with very many balls. In their bag, they are inoccuous enough. Even pretty. Here's what they look like when one twin (Hayden) is in the midst of throwing 10-20% over the banister to his waiting sister. I only prevented the other 80% from going overboard by zipping his hand into the ball bag. Again, this was stopped only by putting the bag into hiding. I guess this reassures me that the balls at home are reinforcing our preschool education. And today at school we sorted dozens of red, green and blue teddy bears into piles by color, thus giving me an idea of something new to try with our bag o' balls. See, I'm learning so much by going to Escuela each day. If only the babies were learning to pick things up instead of throw them. For that, I suppose, we'll be needing a new bag of tricks. I'm learning that one of the nice things about having your own pool is that you can swim with no clothes on. Or at least your kids can, on afternoons when you are too tired to wrestle them yet again into tiny bathing suits. But trust me when I say that Delaney and Hayden love it, despite being somewhat defenseless without any clothes on. I, on the other hand, am not loving the feeling of defenseless that swirls around us in these first few weeks of September. I can't let all our friends think we are sitting pretty (clothed or not) in the Caribbean with no awareness of what's happening in the world, or back at home. In fact -- thanks to satellite TV and no way to go out since the babies' bedtime is 6:30pm -- we probably are watching more of the 24 hour news cycle than you are. So, I am feeling overly exposed to the uncertainty of hurricanes, train crashes, market crashes, embassy bombings, Latin American drug cartels, and an infuriating political election. There doesn't seem to be much we can do from here, except watch TV and watch for the arrival of our absentee ballots. This morning I was exposed in another way, at Miss Peggy's clinic. As my follow-up trauma to last spring's malaria, I have developed some sort of heat rash on my back and neck. I waited in the clinic for my "rapid care" appointment (it shortened the wait from three hours to an hour and a half) and eventually I was ushered, rapidly, to a back room. The dental room. Where an older gentleman was having his teeth done. "This is the only space available. Sit here," said the visiting volunteer doctor pointing to the undulating dental chair. I did, and soon I was also lifting up my shirt and describing what medications I take, right in front of this other guy. I don't have alot to hide and, with two babies, not alot of modesty either, but still, my rash deserved more, and this guy deserved to learn less! One of the greatest exposures we face here on a third-world island is health care, and health emergencies, and we are so grateful for Miss Peggy's clinic. Here is an individual who is making a big difference, whether it's a real crisis or a sunburn because your parents forgot to put your bathing suits on you. It's hard to extrapolate the little life lessons that swirl around a woman like Miss Peggy. Her efforts humble me each time I step into Clinica Esperanza and see the hopes and fears of unknown neighbors that have lived entire lifetimes with no preventative care. Who am I to take up the time of volunteering medical professionals, surrounded by dozens of truly needy people, with an annoying heat rash. My exposure, really, is so very little. But today I'm back to bare naked. Mike took a hard fall this morning on slippery stairs after a big rain storm. Thinks he may have broken a rib. The swelling has started to go down, but the extra-extra strength Tylenols don't seem to do much. 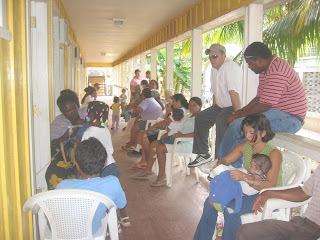 I have a hunch we'll be going back to Clinica Esperanza tomorrow, humbled by how quickly your exposure can change. I'd been trying to get to the beach with the babies since 2:00. Day before yesterday. We were struggling to make it through the first week WOS (With Out Sharla), and I just knew that the change of scenery down at the beach would do us all good. "Let's go to the beach," I said to no one who would actually respond. Hayden grunted as he fit two blocks together and Delaney said "Woof." "Let's go upstairs and put our swimsuits on," I tried again. Delaney headed for the stairs, Hayden headed for the pool. Stairs, pool, which the bigger danger? Close call, but Pool. I ran after Hayden. He's been known to just climb in. "Let's go upstairs and put our swimsuits on so we can go to the beach." I maneuvered him successfully to the stairs. Pitter patter from over my head. She's already up the stairs and taking her clothes off. And putting them into the washing machine. "Delaney, let's do laundry later. Let's put our swimsuits on now." Pitter patter from down the hall. He's sitting on the rocking horse in his diaper. (How did he get his clothes off?) "Stay there," I said urgently. Back down the hall to stop Delaney from throwing her Little People over the banister into Sonoma's waiting mouth. Back into the nursery. In time to see Hayden pointing vigorously at the puddle he's made on the floor, the diaper lying next to him. "That's OK, Sweetie" (where does this patience come from? ), "I'll wipe it up." And I reached for the towel we were going to take to the beach. She's gone back downstairs and escaped to the porch. She's turned on the outside shower by herself and is gleefully cooling off. Hayden took one look and ran to join her. Change of plans: we're taking showers. By now it's 4:00 and I decide that it must be 5:00 somewhere, so let's skip the beach and head to the bar. With Daddy in tow by this point, we started down the gravel path to the beach and the bar. Delaney set out eagerly; Hayden was pokey, in search of lizards. He got a rock in his shoe. Then an ant. And there were no lizards. It's all over. Delaney, Daddy and Sonoma kept going, Hayden and Mommy headed back to the house. The next day we started again. "Let's go put our swimsuits on," I said optimistically. An hour later we really did get down to the beach, and I was right. The change of scenery did us all good. I'd have to say this week is a mixed bag. And it's only Wednesday. On Monday, Sharla went into labor on her way to Palmetto. We haven't seen or heard from her since, but we assume she's had her baby. Also on Monday: losing Sharla, we re-gained my car. (Backstory: my brand new Nissan XTrail lost its transmission on the gravel-rutted road leading up to our house SEVEN WEEKS AGO. It's been in the shop this entire time, waiting for parts to come from Japan. On the slow boat from China. As Mike says, the global economy hasn't found its way to Honduras. But done at last, we picked up the car and gleefully drove home. Before the sun went down, Mike switched the carseats from the Truck back into the XTrail. I'm ready to roll. On Tuesday, we loaded the kids into my car for school with no time to spare. I turned the key and -- oh no -- nothing happened. We swore, scratched our heads, consulted our Spanish-speaking gardener and couldn't understand what he said, and then we gave up. We couldn't face re-switching the carseats, so we blew off school. But without a Sharla, that just meant we had a whole day to ourselves with two babies. To balance out Tuesday, however, the wildly evasive Tropic Air Conditioning gentlemen re-appeared with our seven replacement a/c's that have been on order FOR TWELVE MONTHS. Must've been on the same slow boat from China. Anyway, three Spanish-only speaking young men worked all day and installed the first unit -- in our bedroom, halleluia -- and the magic moment came when we pushed the remote. And -- oh no -- nothing happened. We swore, scratched our heads, consulted our Spanish dictionary and finally understood, there was no freon. "Maybe on the boat," the young men said, "manana." Again on Wednesday, we tried to start my car. This time Mike used his key, not mine. And sure enough! It started. The key I used yesterday had been "reprogrammed" and no longer worked. (Backstory: in the first few months of moving here, I lost my keys. Amidst the 300+ boxes that had moved with us. Mike swore, scratched his head, and paid out hundreds of lempiras to get a replacement. Which only ever worked if you pointed it one way up, not the other way down. Then to our surprise the mechanics apparently found my missing keys in the car while baby-sitting it at the garage for the last seven weeks.) Hmmm. Wish they had told us when they returned the keys yesterday that THEY WEREN'T EVER GOING TO WORK. So off to school we went. But home from school we came, and I drove right into the doghouse. I drove up the gravel-rutted road, down the neighboring hill, up our hill, up our driveway and right off the driveway, which was the equivalent of driving my newly fixed car into a ditch. The driveway sits eight inches or so off the ground (why? not sure. see picture below of driveway installation). And I just drove up it, and over it. Guess I was thinking about something else, like what am I going to do with two babies for the rest of the day? Mike swore, scratched his head, consulted our Spanish-speaking gardener and started shoveling dirt. He and Senor Gomez shoveled dirt under the wheels, tied the Xtrail to the Truck, and eventually pulled it out of my homemade ditch. In defense of my Tropic Air Conditioning gents, the freon did arrive today and for the first time since we moved in TEN MONTHS AGO we will have a cool, humidity-free night's sleep. So will Delaney and Hayden. We tucked them in with blankets, since this will truly be a shock to their systems. And I'm hoping it will cool off my husband, who's been hopping mad for one reason or another since the week began. Welcome to paradise. Hayden has a career in hospitality ahead of him. So says his father, who is amazed by Hayden's desire to push anything in front of him. His favorite push-toy is a double doll-stroller, a gift at my baby shower. He pushes this stroller round and round the house. Down the driveway. Down the gravel path. Up the gravel path. Through the grass. Into the sand. Up the stairs. Down the stairs. Into the dog. Into his sister. But the most amazing sight was 18-month Hayden pushing the luggage cart at the hotel on our recent trip to Houston. Once he figured out where the carts were stored in the lobby, he was right on it. Checking in? See Hayden. Have a lot of bags? Hayden's your man. Gone shopping? Call Hayden. He was particularly on-the-job the day we stocked up at Target, Toys R US, and Baby Gap all in one trip. Hayden's other obsession is cooking. He wants to see everything that's happening above-his-eye-level on the stove, on the counter, inside the refrigerator. He wants the blow-by-blow of scrambling eggs, stirring brownies, or chopping parsley. Not easy to hold a 20-plus pound kid while using your Sandoku. In the market, he'll point to which fruits and vegetables he wants to cook with. Well, I guess maybe he's just pointing to the things he wouldn't mind eating. But I'll pretend that he's planning his challenge as the Next Food Network Star. So between pushing your luggage cart and scrambling your eggs, Hayden could be your host the next time you check in at a B&B. And Delaney? She's at the other extreme. When you're in her way, she'll shove you off the bridge. This week Mike and I went back to school. Delaney and Hayden went with us, marking the start of their 18-plus-year routine at the ripe old age of 18 months. We never imagined we'd initiate them into the world of recess, snack time, and "what do I wear?" while they were still babies. We never imagined we'd be sitting next to them at Circle Time singing "Head, Shoulders, Knees and Toes" -- in Spanish. But all four of us have been going to Discovery Bay every morning. I suppose this makes Delaney and Hayden (and their parents) newcomers to the preschool Class of 2011. I think we have each learned something new this week. Hayden is learning that he can't necessarily drive the Yellow Truck when he wants to. Often (really often) Paia has gotten there first. Delaney is learning how to rock a babydoll with one arm while holding tightly to Mommy's neck with the other arm. She's clingy. Really clingy. Mike is learning how to be the Only Guy in the Room, amidst four female teachers and 20 under-five-year-olds. Today he found the little boys following him around like little boy ducks. I am learning that keeping two children entertained is not that much different than keeping six children entertained. In other words, if you have two, you might as well have six. I think that's what Miss Lily, Miss Ellie, Miss Tatiana and Miss Juri figured when they looked at their own babies and realized they could leverage all this enormous Mommy energy by opening a school. Delaney and Hayden are the youngest in the bunch, a fact which is most noticeable around 10am. All summer long this has been the start of snoozy-time, which when we're lucky has lasted three blissfully quiet hours. But this week our snoozies have been turned upside down by escuela. And never have Mommy and Daddy, at least, needed their own snoozies than this first week of school. My own Mom, a preschool expert and veteran with many playdough stripes, advised us to leave early and let the babies have their naps. Turns out that was good advice, and yesterday and today we enjoyed both the stimulation of Miss Tati's class and the predictability of happy babies throughout the afternoon. Today, Friday, offered another milestone in this week of milestones. Mike accompanied the babies to school alone, leaving me to kiss them goodbye as they drove away but leaving him to be the one-that-she-clings-to. And leaving me with three blissful hours to myself. Perhaps this is the payoff for the midnight wake ups. A few hours to myself while they get muddy in someone else's yard. And when they returned home, I was hopelessly glad to see them. Mud and all. Our island paradise may be sublime but it's also ridiculous. Example: Today we learned that the son of Don Carlos (Palmetto's foreman) accidentally shot the wife of Don Oscar (Palmetto's gardener) in the foot. Aiming for a bird. Now how do you mistake a foot for a bird? And just what was Don Carlos' son doing with Don Oscar's wife? Apparently they haven't been able to remove the bullet because the doctors at the public hospital have been on strike. Unfortunately, Heather's salon has no running water. This, alas, is a deal breaker. How do you have a beauty salon with no running water? Then again, the aforementioned public hospital is also rumored to lack running water. Forget the salon: How do you function as a hospital without water??? This afternoon I must go foraging for food. This will involve a stop at The House of Meat, which sells California eggs and frozen pizza, and the Poison Meat Market, which sells, well, poison and meat. Mike needs some malathion for the coconut trees and I could use some hamburger. It may also mean a stop at Eldon's for imported broccoli and milk in a box. Milk from Florida costs $8 a gallon! We'll stick to the box, thank you, and the occasional road-side cow (just kidding). While I'm at The House of Meat, I'll make a desperate appearance at The New York Bakery & Deli. There I will beg for bread. Which they won't have (and bagels? forget about it), because it's after noon. They will only have cake. But since I'm not Marie Antoinette that just won't work. I want the country wheat. When I am so lucky as to arrive before noon, and buy up their last two or three loaves, Janet the Baker glares at me and says, "What, are you shopping for the entire neighborhood?" If hers wasn't the only bakery on the island that bakes something appromixating a La Brea Bread loaf, I'd boycott. My foraging will conclude with a poke into the Tommy Bahama furniture store, next to House of Meat and the Bakery. Turns out Tommy Bahama manufactures his stuff in Honduras, so it's immensely popular on the island. Used to be a bargain (factory-direct), but the Honduran store owners have gotten smart and marked everything up U.S.-style. So my dreams of Tommy Bahama furniture slowly replacing my Connecticut antiques are fading. But I will still poke. I know, this has nothing to do with food foraging, but everything to do with keeping my spirits high above the ridiculous.